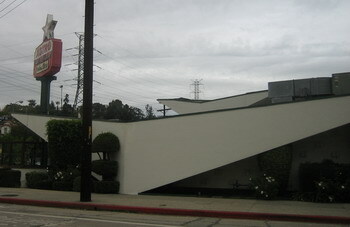 Most architecture buffs know what Googie stands for – a unique form of architecture, very much of Southern California and until quite recently very much undervalued. The problem simply seems to be that many architectural styles only become acknowledged for what they are – or where – once they are gone. Which is sad, but not rare and certainly not a problem found in Los Angeles alone. Anyway, there are still examples of buildings in this style around. Some of the more well know ones are the Bob’s Big Boy in Burbank, the few Norm’s Diners left, Johnie’s on Wilshire (closed and used for filming only). There are more and there are many groups active in keeping the still existing examples of a time intact when architecture soared, together with the hopes and dreams of Americans for a better future in modern times. This building is the work of the notable architecture team Armet and Davis. 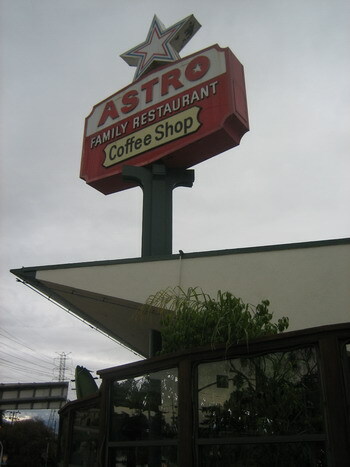 Originally it was Donly’s, then Conrad’s, today it is the Astro Family Restaurant. All the elements of classic Googie are assembled: the neon sign with the star shape, the upward sloping roof, the acute angles, a lot of glass and bright, flashy colors inside (not seen here). For the architecture lover and the late, late bird (Astro’s is open 24 hours) I can recommend the place. Food lovers should beware and avoid it. That style was quite favored by motels of the 50s and 60s. 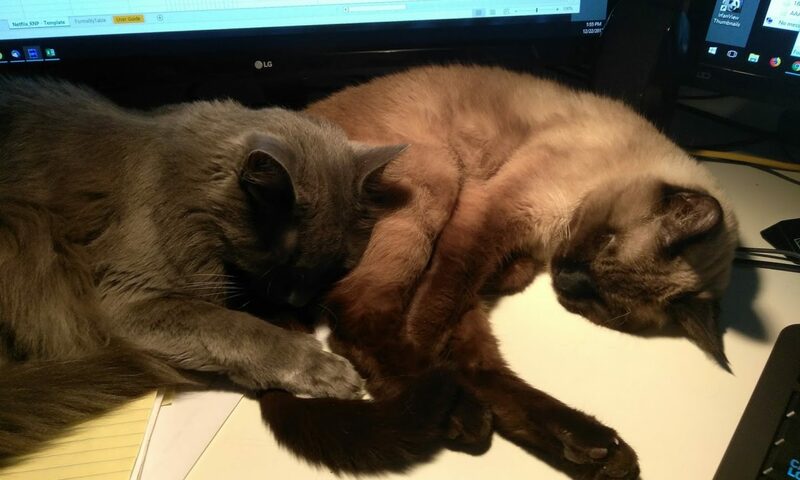 Sadly, they’re all gone now I imagine. the Caliente Tropics in Palm Springs. It is not exactly a 4-star-place, but interesting because of the style. As far as I know, it is the last of a chain of Tiki-style-places built by a certain Kenneth Kimes. I disagree, the food here is fantastic, best Spinach Meatball soup I’ve ever had and the meatloaf rocks and the french fries are old school and great. If you are some chic chic Weho queen who wants light fare for your next circuit party half naked romp then by all means stay away. Well, I did not have the meatloaf there, although I know about perfect meatloaf. I cook it myself, and grown men have eaten it with tears of delight in their eyes. However, reading your description, I will try the Astro meatloaf on my next trip. It is always interesting to check out what the competition does.